Bushwacking Pirates Sword are almost here! It's a wonder I find them at all! A tool every caching pirate needs when out in the bush! Buddyluv4 came to us nearly a year ago with these awesome idea. We knew it could be done, we just needed to figure out how! Jamie at Madhatter Neverland created the design. Then off to make it happen. Finally we got it to work. I am proud to announce our two peice coin set. These will be available mid March. The sword measures 2" and the scabbard 1.60". Those are AWESOME. If you are taking rezzies, please put me down for one antique silver! Holy cow those are nice !!! That is such a cool coin!! Hope I don't miss the sale for these. Are both pieces trackable separately? How does the sword stay 'latched' into the scabbard? Yes I agree this is an awsome idea. 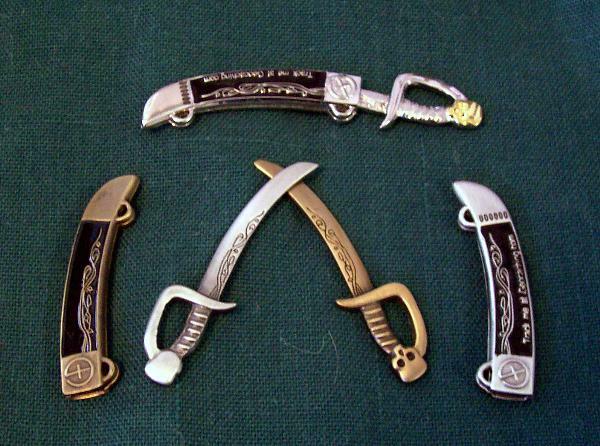 I was thinking about making one of those small decorative letter opener swords a TB but decided against it cuz those letter opener swords can be kinda sharp and actually be considered a knife sometimes. But I've always wanted to see somthing like this. Great job!! Please, if you making a reservation list, can you include me for a set as well? OMG!!! Those are so COOL!!! Amazing! Any guesstimate on pricing and ETA? Originally the idea was to make them both trackable. But there really is no room on the sword for all the information needed. It end up being all information. We also debated a chain to keep them together. But the HWS lackey felt that the chain would be so long and who wants to sword fight with a scabbard hanging down? This said lackey is in charge while the cat is away and made the coporate decision to let them be chain free. If you hold them upside down, you will lose your sword. But they stay nicely in flips and are really fun to play with! Very nice, I would certainly get some. Very nice! Great Idea, we will keep an eye open for these. Tsk, tsk, tsk, no knives in caches! I'm sure these are not long enough or sharp enough to do any damage. But it was my first thought on seeing it. Good luck on your coin. Not a knife. A sword! No Causalities reported in the test market thus far. Cool idea and design. I'll keep an eye out for this one. oei oei oei i wish now that i had never promise that i don't buy coins anymore. Nicely done! Must have been quite a trial with multiple pieces. Are you attaching anything to the suspension rings? Awesome! Can't wait to receive ours. Wow! Count me in for a set. I will have to get a couple sets. Menace wants one and his brother who caches with us wants it too. Hopefully I don't miss the sale. What a fun coin!! Definitely on my wish list!! Very unique. We will keep an eye out for these. Now that is a NICE coin!!! Awesome idea! Glad to see you were able to get them made the way you envisioned...we know how it is to work on a project for almost a year.....frustrating during the creation, but very rewarding once complete!!! Thumbs up!! Those are great, I would love to purchase a few. Just don't 'put' an eye out. Great looking coins. Strap it to a TB Action Figure and send them out for a double discovery. I'll be getting a few of these because my son will want one for sure. Any hint regarding price and where to order? Please, pretty please? I want to bookmark the site and calendar the date so I don't miss out on these beauties! W00t! Very nice!!! Great idea Buddyluv4!! I would love a silver one...a two tone would be even better! These ARE awesome!! Are you taking pre-orders, reservations whatever you call it how can I get my name on it for a pair?? I'll be watching this thread for sure! These are great. Very cool idea! VERY Nice! I haven't been excited about a coin in a while! Definately want a few of these! Put me on your list! OOOOOHHHH!! Put me down for a set of all 3 if you have a reservation List!!! Absolutely AWESOME!!! !